The 21 members of the most dynamic regional grouping in the world are on the verge of taking a major step towards raising the prominence of services through their imminent adoption of an Asia Pacific Economic Cooperation (APEC) Services Cooperation Framework (ASCF). The move is particularly notable, given that in 2012 APEC countries accounted for 44 percent of world trade, 40 percent of world GDP and of world population, and 52 percent of world FDI flows. This new initiative was welcomed by APEC Trade Ministers at their meeting in Boracay last May as they highlighted the plan to provide common direction and more coherence in APEC’s work on services through the ASCF and the APEC Virtual Knowledge Centre on Services. Once finalised, the Framework will provide a common strategic direction and coherence to APEC’s broad-based approach to services competitiveness, thus ensuring that APEC’s multi-fora and multi-stakeholder services agenda remains dynamic and responsive to economic, market, and technological developments. Such a framework would better enable the region’s economies to address trade-related services restrictions and review the progress of agreed action plans to liberalise services trade, in light of APEC’s Bogor Goal, namely free trade and investment in the Asia Pacific region by 2020. While many APEC committees and groups have been working on services over past years, this work has been dispersed and has not had the visibility or the focus that many APEC economies feel that services require, given their central role in promoting economic growth and more inclusive development. The APEC Services Cooperation Framework has grown out of the advocacy efforts of the APEC Business Advisory Council (ABAC), the private sector body that provides advice on the implementation of the APEC agenda and on specific business sector priorities, and the Pacific Economic Cooperation Council (PECC), a unique tripartite partnership grouping in support of trade integration and liberalisation in the region that preceded the creation of APEC and that provides information and analytical support to APEC’s work. Both of these groupings have advocated for a higher profile and more emphasis on services within APEC for the past several years. The Framework has resulted from the valuable groundwork of the Public Private Dialogues on Services, begun in 2013 during the Indonesia APEC Year and continued since then. These dialogues provide a valuable opportunity for an exchange of knowledge on services with the private sector, which has shown itself to be engaged and enthusiastic about these discussions. The adoption of the Services Cooperation Framework by APEC is of great significance as it will raise the profile of services work in APEC to the highest level and bring coherence and focus to an area that badly needs this, given the large and diverse number of sectors and regulatory agencies involved in carrying out services trade. The Framework will ensure attention to services by APEC senior officials, ministers, and leaders on a continuous basis. Given the importance and esteem in which APEC work is held by participating economies, this step will also provide a model for these to follow at the national level, encouraging the mainstreaming of services into national development plans and targets for liberalisation and regulatory reform. APEC’s initiative on services may positively impact as well the outcome of ongoing FTA negotiating initiatives in the Asia Pacific, in the form of Regional Cooperation Economic Partnership (RCEP) being led by ASEAN with six priority partners (Australia, China, India, Japan, Korea, and New Zealand) and the Free Trade Area of the Asia Pacific, whose detailed table of contents is under development for a major feasibility study. Among the areas that the framework might include is structural reform, where regulatory reform in services has been discussed this year and will be very much on the APEC agenda for 2016 given the holding of a meeting of APEC ministers responsible for structural reform. Structural reform was also the subject of a joint meeting of APEC’s Group on Services, APEC’s Economic Committee, and the PECC. 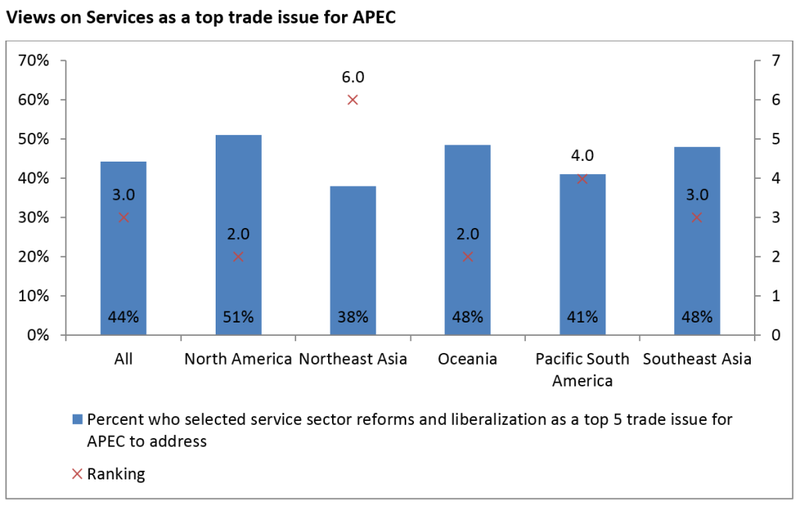 The restrictive impact of services regulations was highlighted by the PECC State of Trade in the Region Report for 2015 as the top impediment cited by respondents to their ability to trade in the Asia Pacific and as one of the top priorities for APEC to address. Importantly, the significance of the services sector reforms and liberalisation was a view broadly shared across all APEC sub-regions. For example, among respondents from Southeast Asia, 48 percent rated it a top 5 trade issue for APEC to address as did 51 percent of respondents from North America. Development of a mechanism for reporting, reviewing, and updating the ASCF beginning in 2016, on the basis of specific quantitative indicators, to be incorporated into a stand-alone report on APEC’s progress towards free and open trade and investment in services. With the adoption of the Services Cooperation Framework this year by APEC leaders, APEC will be at the forefront of tackling the most important issue determining the economic future of its member economies and should be able to influence their ability to escape the drag of the middle-income trap. Sherry Stephenson is the Theme Leader of the E15 Expert Group on Global Value Chains and Group Manager of the group on Services. She is a Senior Fellow with ICTSD.